The ECD cash drawer series from APG for retail and hospitality are made of robust steel for a long service life and feature high-quality workmanship. The cash drawer ECD400 is equipped with 8 coin and 4 banknote compartments. It has three locking variants and an RJ12 / 24V interface. 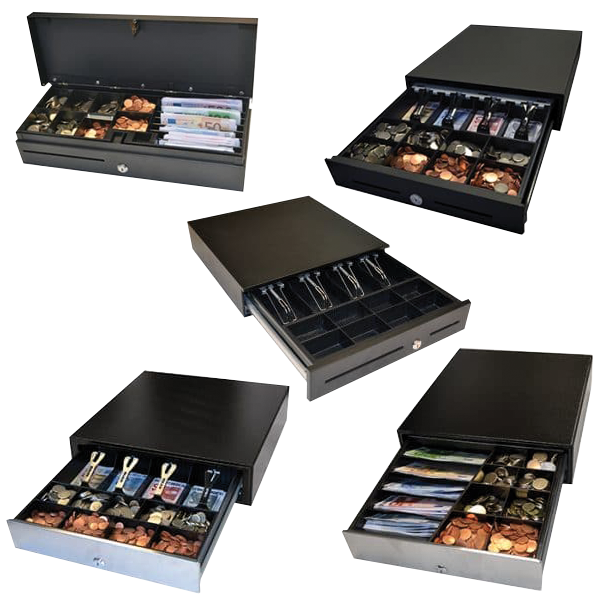 The ECD410 cash drawer also offers your customers 8 coin and 4 banknote compartments. It has three locking variants and is available with an optional, lockable cash drawer insert. The compact miniature cash drawer ECD330 with a polished front has 8 coin and 5 banknote compartments. It offers your customers two locking functions. The hinged lid cassette ECD460 is made of robust, black steel with a polished front. It has 8 coin and 7 banknote compartments with plenty of space. It also has two locking functions and is ready for operation in no time via a 24V interface and the 1 meter RJ12 adapter cable. A lockable steel storage lid for the drawer is optionally available. Order the APG cash drawers and hinged lid cassettes of the ECD Series with your sales representative. Give us a call today!